A semi-circular area around a window below the grade of the house, reinforced by a sturdy material such as galvanized metal or masonry. Window wells allow for emergency escape from basements, and provide natural light, and ventilation to those areas. 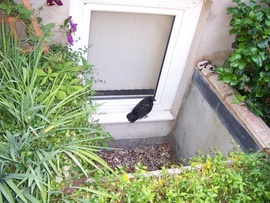 Covering window wells is useful to keep debris out and protect against people and animals falling in. Installation of a window well will cost from $500 to $2,000 depending on the materials used and the grading and drainage requirements. Covers cost about $600 to $800.